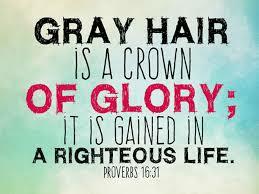 A crown of Glory? 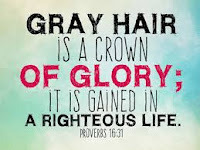 yes, this is what it is to have a head covered in grey hair, and yes, we have all probably known a few individuals who have “greyed” before their time, the most common manner in which one would attain this “Crown of Glory” is to earn it throughout our years lived upon the earth. 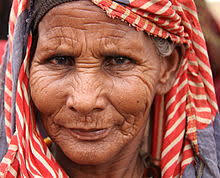 Before moving further, let us place into proper perspective, the second part of this verse which states that only if it, being the grey hair, be found in the way of Righteousness, it is a crown of Glory, any other way, and it is only an example of pain, adulthood stress, and the tole of time on the human body. Now that we have established what it is to be elderly according to the definitions of this world, and of the Bible, we must delve into the concept of Righteousness described here in Proverbs 16:31 as it is an important aspect of the Crown of Glory. Once again, we will be referring to a great resource, dictionary.com and their definition of Righteousness. Righteousness: the state of being righteous, or righteous conduct, now in order to determine what we are looking at here, allow me to look into the root word of Righteousness, which is the word Righteous. Morally right, justifiable, characterized by uprightness, or morality, these are a few of the definitions listed for the word righteous; however, the unadulterated truth is that Righteousness is of the Lord, and no man can attain true Righteousness outside of a real and honest relationship with Jesus Christ the Lord. A few weeks ago, I received a phone call from a friend, who happens to be the mother of another good friend, whom we shall call Jane. Jane at one time acted as a surrogate mother to me and many others in our old neighborhood. As one may expect, as time passes, relationships can sometimes change in ways never before expected in the past, and this was one of those situations. When I was a younger man, going all the way back to my teen years, I had a tendency to get trouble from time to time, and when I did, Jane would sometimes be the woman I would call in an attempt to prevent my own mother from discovering the trouble I was in. Fast forward several years, and now Jane, a woman I call mom, was calling to ask for help as I once called to ask for her assistance, and so I answered, and I listened to hear what it was I could do for her. Upon answering the phone, I could hear sadness in Jane's voice, in response, I began to speak softly to her, reassuring her, that whatever the problem was, I was more than willing to help. As she began to speak, I began to understand what it was that she needed, grandma was sick, and not doing well, approaching the eldest of the elderly years, grandma had realized that she hadn’t been baptized, and her request was to be Baptized into the Kingdom, and I quickly volunteered, I told Jane that it would be my honor and pleasure to baptize grandma. A few days later, on a sunny Sunday afternoon, grandma was baptized. What does any of this have to do with Righteousness? Well, in actuality, it has a lot to do with Righteousness, you see, if we are not Righteous in the sight of God, we are not deemed worthy to be in His presence; therefore, we are cast away, far from Him, into the pits of hell. But, and there is always a BUT: if we are to live with the Lord in Heaven, and if we are to become the Hands and Feet of the Lord here in Austin, Texas, USA, or anywhere else, we must first take a few steps in the right direction. According to the Word of God, we must repent of our sins, we must give our lives to God, we must be baptized, we must honor the things of God, and we must be filled with the Holy Ghost. In order to please the Lord we must continue to study the Word and unite in Prayer, we must understand that Jesus Christ is our source, and our Righteousness. Righteousness? What does any of this have to do with Righteousness? You see, although grandma was up in age, she chose to give her life to Christ, she accepted Him as her Lord, Savior, and King, she was Baptized according to the Word of God and the scriptures, she was washed clean, and became brand new, Righteous in the sight of God and man, washed by, covered by, and filled with the Power of the Holy Ghost. Jesus Christ our Lord was beaten far beyond recognition, battered and bruised, and it is that Blood that was shed on Calvary Hill that has become the source of our Righteousness, and it was that blood that has made grandma’s grey hair, a Crown of Glory, and it that same Blood that can wash away our sin, making us brand new at any age.